On way back from family holiday in the Dordogne we stopped the final night at Le Touquet. Being so close to Etaples I couldn’t resist a visit to the huge military cemetery there, the largest in France with 11,479 casualties buried here. 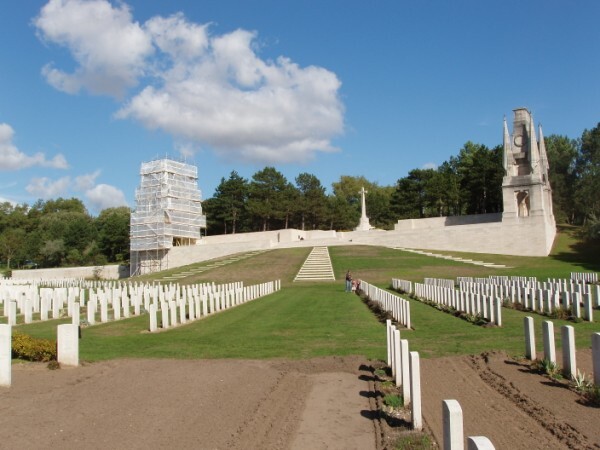 This is only marginally smaller than the number buried at Tyne Cot but I would venture it receives a fraction of the number – there were only a couple of other visitors whilst we were there. I have been a number of times before on battlefield trips and have always battled the rain and cold but was blessed with wonderful weather on Saturday. It looks like maintenance work is being carried out on the entrance structure and some areas were being resown with grass seed. 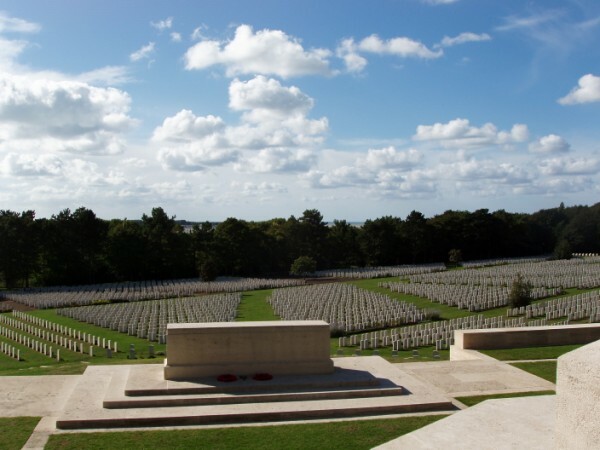 It really is well worth a visit and is especially poignant that one can see the sea from the cemetery entrance. For so many men it was a case of so near and yet so far. 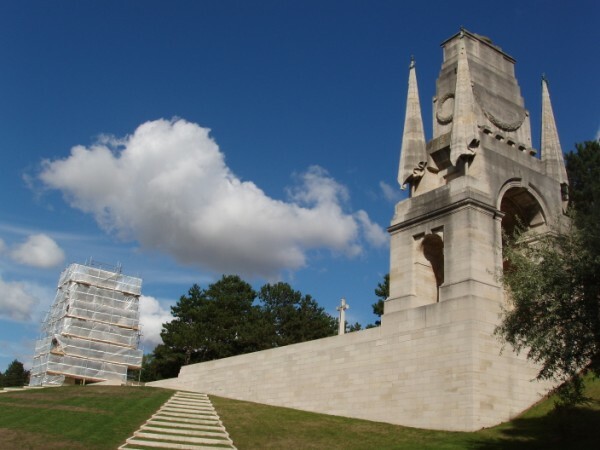 In fact, next time I am heading to the Somme I think I will take the A16 this way from Calais – via Wimereux and Etaples and then stopping at Montreuil to see where Sir Douglas Haig had his headquarters and then continue down to Amiens and into the battlefields that way. It is a fascinating route and surprisingly pretty too! Whilst at Etaples I really wanted to pay my respects at the grave of Lt Colonel William Dawson, DSO & 3 Bars, 6th Queen’s Own (Royal West Kent Regiment) who is buried in XLV. A.10. Dawson was quite a man – I understand that he refused promotion above the level of battalion command and was entitled to wear seven wound stripes. He is mentioned in Alan Thomas’ wonderful book, ‘A Life Apart’. The one bit of that book that always struck me was when Thomas referred to Dawson’s bravery and reaction to shellfire. 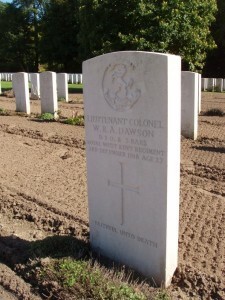 Sadly Dawson was hit by shellfire in October and died in December 1918. Truly a brave man. I never believed in a man bearing ‘a charmed life’. If I had, I should have put Dawson high on the list. So, I think, would most of the battalion. For when you were with Dawson you felt safe. Often I walked by his side along the stickiest of roads and through the unhealthiest of trenches, and because he was with me I did not feel afraid. Had I been alone, I could scarcely have dared to creep along even on all fours. But he would stride ahead, with his pipe in his mouth, as confidently as if he had been walking down Bond Street. (As a matter of fact, he would never have been seen in Bond Street with a pipe on: his ‘West End’ standards would have seen to that.) Did he know what fear was? I often wondered. Then one day, in 1917, I came across him alone. Our lines were being heavily bombarded and I was going along my sector to see if the men were all right. Turning into one of the bays, I ran into Dawson. He was standing in an odd position: instead of leaning with his back to the side of the trench, he was standing facing it, gripping the mud wall with crooked fingers. His expression was drawn, as though he were in pain. On seeing me, he relaxed and tried to laugh. It was the laugh of a nervous, frightened man. I gazed at him, wondering what had happened. For a moment I thought he might have been wounded. ‘Are you hit, sir?’ I asked. ‘Hit?’ He repeated the word as though he did not know what I meant. Then he went on: ‘I suppose it’s never occurred to you that I could be frightened?’ He was looking at me squarely and had got possession of himself again. I said the idea had never occurred to me. ‘Do you think I like these bloody bombardments,’ he went on. I told him that I didn’t think that, either, but that I had never seen him afraid. ‘No, sir,’ I said, feeling proud that he should seem to place me in the same category as himself: that is, the category of the really brave who feel afraid but do not show it. ‘But I don’t mind telling you now –’ he added, but evidently thought better of it, for he broke off and with a gruff, ‘Come on’, led the way along the trench in his usual confident way. And, walking behind him, I felt safe. Well, that was Dawson – or some idea of him, at least. Copyright: Alan Thomas, A Life Apart, Victor Gollancz, London, 1968.